Here I will explain what is dictionary in c#, vb.net with example or dictionary object in c#, vb.net with example or how to create and use dictionary object in c#, vb.net with example. Dictionary object in c# or vb.net is a collection which is used to represent data as a key and value pairs. 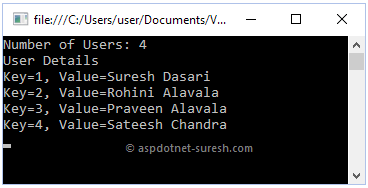 In previous posts I explained difference between array list and list in c#, vb.net, connection pooling in asp.net with examples, difference between initialization and instantiation in c#, vb.net, cursor in sql server with examples, difference between char varchar nvarchar in sql, difference between ref and out in c#, vb.net with example and many articles related to interview questions, asp.net, c#.net. Now I will explain what is dictionary object in c#, vb.net with example. Dictionary is a collection object which is used to store data in key and value pairs. In dictionary object Key value must be always unique and it won’t accept any null or duplicate values because we use keys to identify values stored in dictionary object but values can be duplicated or we can set null value also. The Dictionary collection is a part of generic collections so to use Dictionary object in our applications we need to add following namespace in our applications. We will see the syntax of using Dictionary object in our applications. Following is the syntax of using Dictionary object in our applications. The Dictionary class will accept two parameters one is for key and another for value. TKey – It defines what type of keys which we are going to store. TValue – It defines what type of values which we are going to store. It’s always recommended to use IDictionary<TKey,TVal> interface instead of Dictionary<TKey,TVal> class. We will see how to add elements to Dictionary object and how to access Dictionary object elements with example. Following is the example of using Dictionary object in our applications. If you observe above example we are adding elements to Dictionary object “objdic” and getting elements from Dictionary object “objdic” using “KeyValuePair<TKey, TVal>”. Now we will run and see the output that would be like as shown below. Following is the result of Dictionary object example. In Dictionary object we have different properties and methods available to perform like getting count or elements or check elements in Dictionary object or get particular value from dictionary object with key value, etc. Following are the properties available in dictionary object. It’s used to gets or sets the value associated with the specified key. It’s used to get collection containing keys in the Dictionary<TKey,TValue>. It’s used to get a collection containing the values in the Dictionary<TKey,TValue>. Following are the methods available in dictionary object. It is used to get the value associated with the specified key. It removes all keys and values from the Dictionary<TKey, TValue>. It determines whether the Dictionary<TKey, TValue> contains specified key or not. I hope it helps you to understand dictionary object in c# or vb.net.